Register Your Book: The Ask Leo! 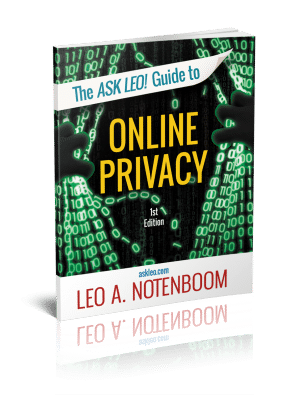 Guide to Online Privacy - Ask Leo! That’s all there is to it. Once you’ve completed checkout you’ll have an Ask Leo! account. As long as you’re logged in to that account — using the My Account item at the top of the page — you’ll have access to theThe Ask Leo! Guide to Online Privacy – Owners Page.